Just when you thought this is it… a family of bluebirds or chickadees- nature might play a most wicked April Fool’s joke! Except it’s not funny and most times fatal to nestlings. Should you become inquisitive and brave enough to monitor the nest inside your birdhouse (yes, it’s recommended) and spot an egg that’s different in size and/or color- it’s likely the wicked antics of a cowbird. Talk about shirking responsibilities! Known as parasitic eggs, because Mom will deposit her egg in the nest of another bird, typically with at least 2 eggs already laid. She then flies off leaving full responsibility for upbringing to the unsuspecting parents. Imagine trying to raise a baby who has grown twice the size of yourself. Just picture that for a moment. 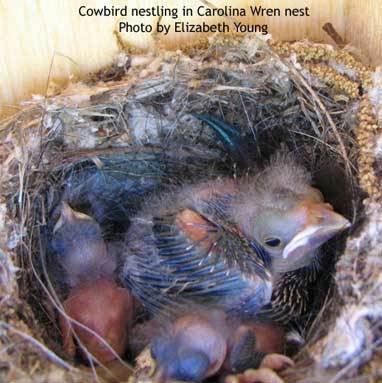 Other nestlings in the group barely have a chance at survival as the large cowbird baby hogs most of the food. This actually happens often- to wrens, bluebirds, chickadees, tree swallows and others. Some birds recognize the foreign egg and may abandon the nest or remove the egg. Most birds are unaware an imposter is looming, and end up raising the ridiculously large intruder to the detriment of their own nestlings. It’s the natural instinct to thrive, though cowbirds won’t be bothered raising their own. Also considered nomadic, they tend to follow livestock herds for the abundant insects, their habitat being open grasslands and meadows which are far away from most nesting spots. Cowbirds are native (unlike house sparrows or starlings) and are protected under the Migratory Bird Treaty, thus it’s illegal in most cases to remove the egg. Sometimes permits are issued to bluebird monitors and others when circumstances warrant. This is just one good reason for using correctly proportioned birdhouses. Nix the houses with really large entries, they do no favors to the birds you’re trying to attract. Avoid feeding birdseed containing millet as the tiny round seed tends to attract cowbirds. Most birds will flick this filler seed out of your feeder and onto the ground anyway. 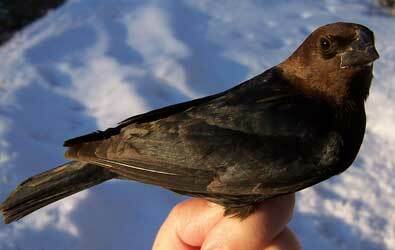 A bit smaller than blackbirds, cowbirds have brown heads. To view they gray female or juvenile cowbirds- check sialis.org for more informtion. And should you like to become a really, really good landlord- monitoring nests actually helps backyard birds thrive. 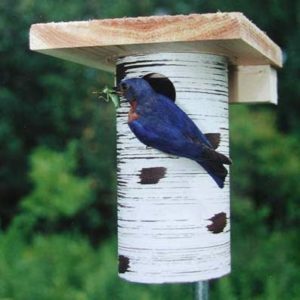 Head over to Sialis.org where you’ll find a wealth of information and any question answered on hosting bluebirds and all native cavity nesting birds (those who use birdhouses). Barn Swallow Nest Cups are Back! Like hummingbirds, barn swallows will soon be returning to previous nesting areas (and new ones too). The behavior is akin to a faithfulness or loyalty to favorable locations from previous seasons. Since the birds are extremely beneficial to have around the yard, gardens and barns for natural pest control, you can easily entice them with our barn swallow nest cups. Handmade set of wooden nesting cups closely resemble a barn swallows’ own digs! 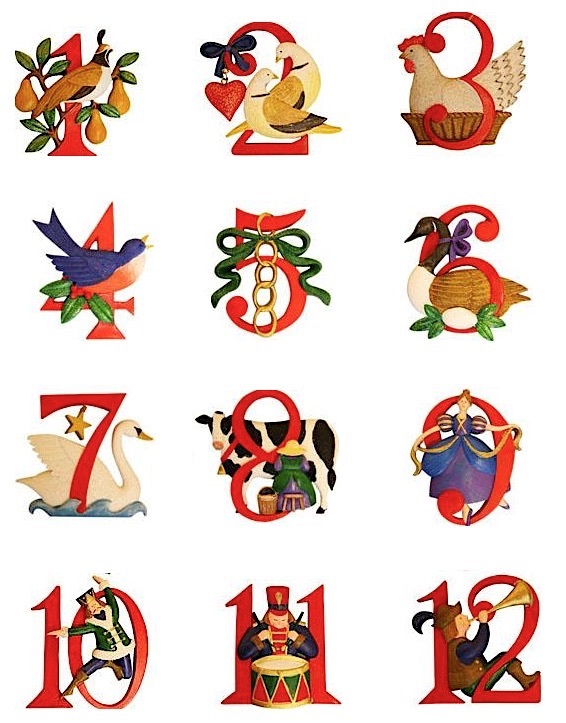 Simple to hang, they’re best placed up high near roof lines or eaves and most definitely sheltered from the elements. Do they really work? You bet! Just check out some of the on-page reviews over the years. And especially Leda’s testimonial with pictures for living proof! 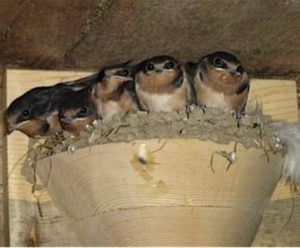 Swallows adore the sturdy artificial home and folks are thrilled as the nest cups allow the birds to be coaxed from inconvenient nest spots- a common occurrence around stables or barns. Nine times out of ten, the birds will use the cups for their second brood… and return next year to use them again. Don’t be too surprised if an Eastern phoebe takes up residence either… they like the nest cups too! Now’s the Time for Bluebird Houses! 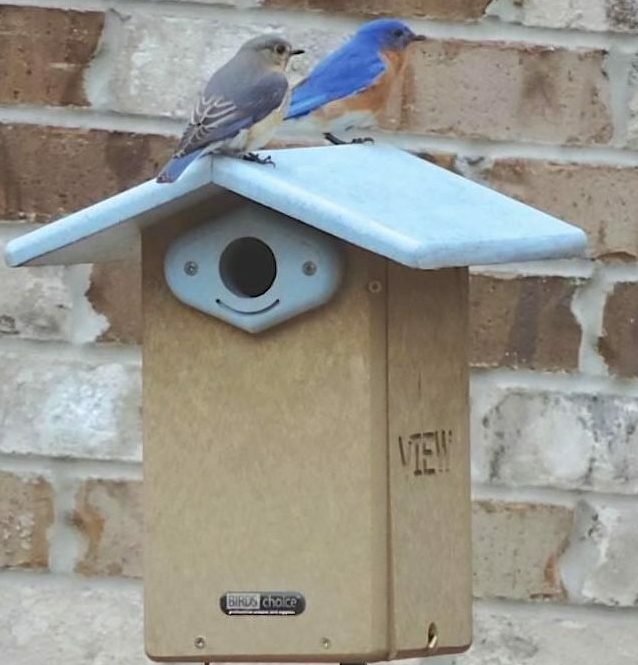 They’ve started already, in the Southeast and further North, lots of folks are reporting first nests and first eggs laid in their bluebird houses. It’s one sign of springs’ arrival… bluebirds are house hunting! Bluebird landlords (or folks who monitor bluebird houses) are eagerly awaiting the first clutches. Weather can be a tricky factor with late winter/early spring broods as natural food is still scarce. 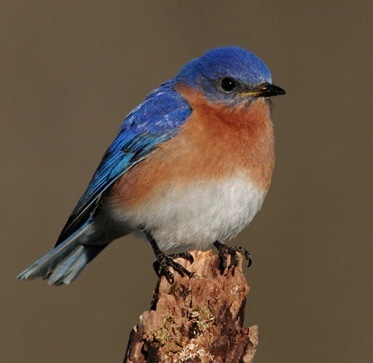 Bluebirds’ diets may be supplemented with meal worms, suet, shelled peanuts and sunflower hearts to help brooding birds cope with frigid or extremely wet weather. 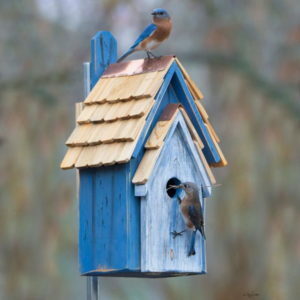 Find the most handsome bluebird houses for all tastes, most are approved by the North American Bluebird Society (NABS). A house with side door makes for easy monitoring, as does the famous Gilbertson Nest Box. 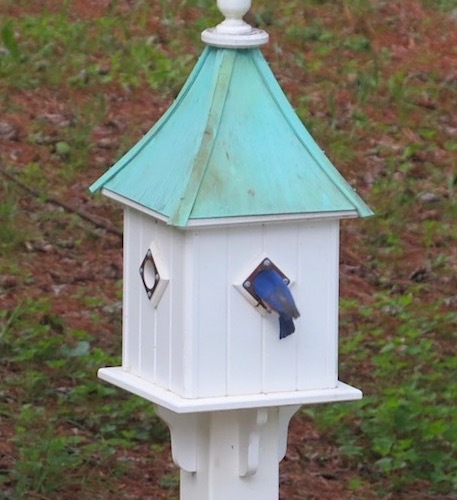 High quality and USA made, find durable cedar, recycled plastic (or poly-lumber) and stunning vinyl bluebird houses with copper roofs. Standing the test of time, bluebirds will return to these fine digs year after year should fledges be successful. Yes… monitoring is highly recommended to help keep bluebirds safe. No… you won’t disturb them if you tap on the birdhouse first, steer clear of busy feeding times (dawn and dusk) and especially refrain prior to fledge time (about 19 days after hatching). The latter may scare babies into an early fledge for which they are not fully prepared. 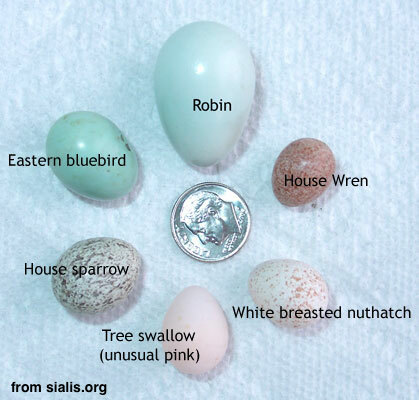 Check out the website Silais.org for a wealth of information on bluebirds and other native cavity-nesting birds. Every question will be answered on this addictive site! 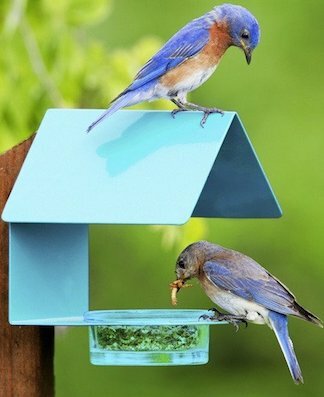 If you don’t have a blue bird house up yet… don’t fret. But now’s the time! Blues will brood two, three and sometimes even four clutches per season. Open space is best with tress or fence line nearby for bluebirds to perch, hunt insects and guard their nests. Fresh water in a birdbath always entices feathered friends too! So what are you waiting for? It’s time to get your bluebird house on! Edible Birdhouses are Back for Holiday! Ya just can’t go wrong with two gifts in one that birds love. Not to mention that edible birdhouses also put a smile on the recipient’s face! 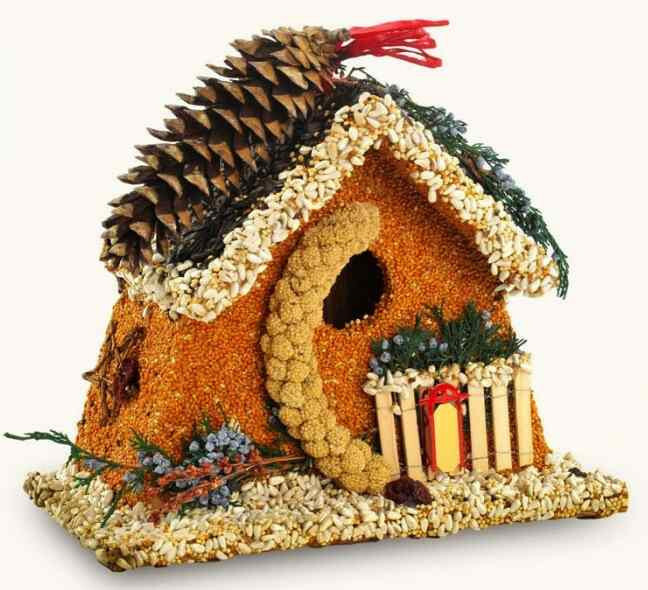 From the heartland USA made, premium quality seeds coat these fun and festive birdhouse-feeder delights. More than just a pretty little whimsy, underneath is a real wooden bird house that serves as nesting spot and winter roost once seed is consumed. The Bed & Breakfast Chalet or Wren Casita will see lots of winter feeding, and then host many successful broods over the years! For use as a feeder: Best to hang in a sheltered area- away from squirrels and the elements. 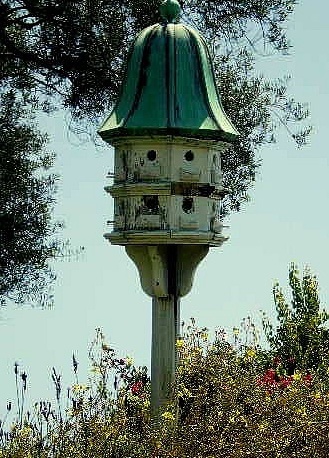 A weather guard or squirrel baffle is ideal, allowing it to feed more birds over a longer period of time. 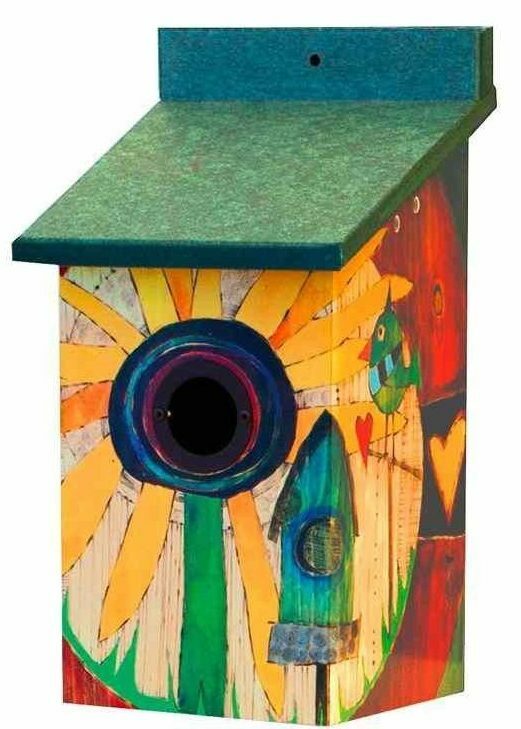 Once the seed is consumed: The birdhouse may be stained, painted, or left natural. Simply hang from a branch in a quiet area to provide songbirds the perfect nest site. During the “off-season”, they offer swell roosting spots too. A win-win holiday gift for any backyard birder or nature buff, edible birdhouses simply rock for their fun character and functionality. The birds will thank you too! That majestic dovecote birdhouse has seen better days. It now sites like an eyesore, rotted and crumbling. The only thing remaining intact is the beautiful copper roof. Sad but true, in all cases wood eventually succumbs to weather. 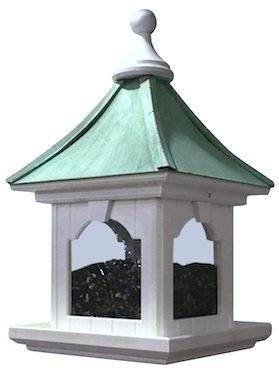 Our dovecotes are meticulously crafted of vinyl/PVC although they look like wood. Folks think of vinyl as cheesy, slick-looking plastic… but it’s the furthest thing from the truth. 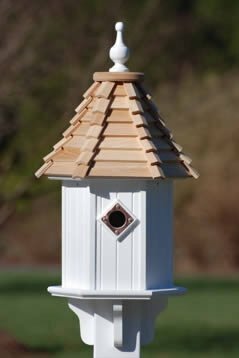 Over the years, some customers have even had concerns they’d received a wooden birdhouse- when in fact it was a vinyl dovecote! But do the birds use these birdhouses? You bet! This male Eastern Bluebird is actually feeding mealworms to nestlings. How do we know this? The smaller dovecote happens to be our own! Installed about 6 years ago in an open area, it’s hosted many successful broods over the years. Yes, the copper roof could use a cleaning which simply entails a soft cloth, gentle soap and water… and time! After these babies fledged, nest clean-out was in order. Climbing up and lifting the roof revealed that three other old nests had hosted chickadees, nuthatches and a prior bluebird family. When making an investment in your landscape, it’s a good idea to opt for quality, and something that carries a guarantee is always best. 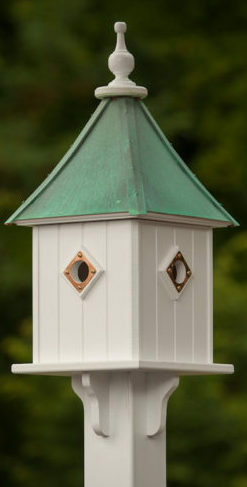 Stunning copper roof dovecote birdhouses are USA made and made to last a lifetime. Wood is never used in their construction, neither on finials nor decorative brackets. This means deterioration simply won’t occur because the material is inert. Resisting insect damage, the dovecotes will never warp, rot or peel as wood behaves. To celebrate Earth Day, here’s a few cool birdhouses & feeders that don’t require cutting down trees… we’d much rather save the trees for birds! The real beauty lies in the textured vinyl because it looks like wood. 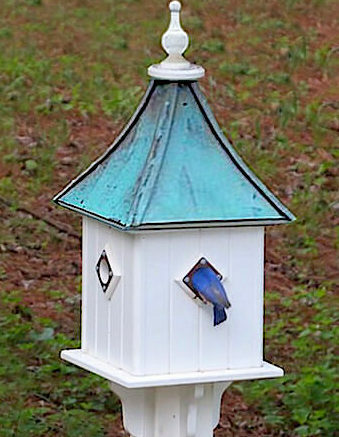 Many folks do prefer a natural look in the garden, and our copper roof birdhouses and feeders really do pass for wood. In fact, some past customers have insisted they received a wooden bird house! 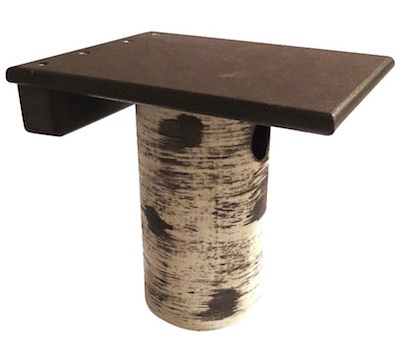 Vinyl, poly-lumber and recycled plastics have numerous advantages over traditional wood when it comes to birdhouses and feeders. Wood is good but it will always weather. These man-made materials are inert, in other words, they’re impervious to the elements and to insect damage. They will never crack, split or rot, and there’s no maintenance (except for regular cleaning of bird feeders). A soapy rag and forceful spray from the garden hose will cleanup environmental grime in a snap, leaving the house or feeder looking new again. The inside non-porous texture is much healthier for local birds in the yard because mold and bacteria can’t settle into cracks and crevices as it typically does with wood. It also makes cleaning much easier and more effective. Color is integrated with materials so scratches, dings or dents are barely noticeable. Recycled plastic or poly-lumber helps keep plastics out of landfills. One manufacturer uses labels saying how many milk jugs it took to make the item. Of course there will always be wood birdhouses too, but the trend has shifted to salvaged, found, vintage and reclaimed wood from barns and other structures. 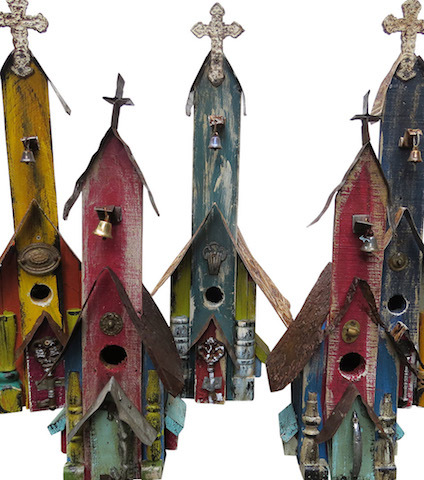 These unique birdhouses are usually handmade by artisans with a passion for birds, with each piece possessing an individual character and charm. Many styles are even one-of-a-kinds. Birds love them too and will be quite happy calling these places home to raise a brood or two! Happy Earth Day… time to go get out and garden! Years ago, in a well-meaning gesture, the nice lady only wanted to help the birds. She’d purchased 4 or 5 birdhouses but phoned us a few weeks later to advise there were no takers. In the Southeast, nesting season was in full swing, and she related the many species of birds in her garden. Since none of this made much sense, we asked about birdhouse placement? Clustered together, attached to a once mighty tree that succumbed to storm damage, this was not the ideal locale as most birds prefer solitary housing on a post or hanging from a branch in a quiet, secluded area. Strike number one. Upon further discussion, she told us that placing dryer lint inside each birdhouse was meant to lure the birds to their new homes. Say what… dryer lint? Would a bird ever really find dryer lint and use it for nest construction? Chances are slim to none because it’s not natural, it’s not something found in nature. Strike number two. 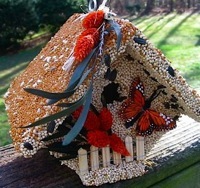 Birds prefer to decorate their own digs, be it inside a birdhouse or natural cavity found in trees and snags. They use materials that suit their liking, materials readily found among nature. Things like grass clippings, mosses, feathers, pine needles, weed stems, twigs, leaves, wood chips, hair and fur, bark, mud and plant fibers. The list is varied and mostly species-specific. They’ve been doing it a really long time too… before we ever started offering birdhouses or feeders. To celebrate spring’s arrival and the start of nesting season, we’re in the midst of our spring promo… free nesting materials with all orders! No codes, no minimum purchase required. You’ll receive a bag containing horse hair, alpaca fur, 2 kinds of moss, a bit of short raffia strands and feathers. An instruction sheet is included with easy ideas for offering the materials. The main trick is to be ready before the birds start claiming territories and nesting! These natural materials (not dryer lint) will further entice friendly fliers to new birdhouses. Please steer clear of this man-made material as birds are unfamiliar, and it retains moisture as well. Also if saving pet hair for birds’ nests is up your alley, please avoid doing so if your pet has been treated with flea/tick medicine. The commercial below absolutely rocks, definitely worth a view! Lots of bluebird chatter recently and lots of chasing from feeders. It’s only January but in the southeast this activity means one thing… bluebirds are claiming their territories already! The chattering along with the comical tip of the wing proves dad’s ready to find mom, pick the right blue bird house and get to work! The previous family unit is severed and all bets are off now as juveniles are no longer welcome at meal worm feeders. Less than one full season old and it’s time to go find your own digs and significant other… they do grow up fast. It’s difficult to watch sometimes, so you put extra meal worm feeders out and hope everyone gets a fair share. But instead, panic ensues and papa is frantically chasing his own offspring from feeder to feeder to feeder. Good grief! This is precisely why having more than one bluebird house within view of another doesn’t work. But one in front, one in back does seem to work peacefully. And it’s worth it because watching blues nest and raise their young is fascinating. And it goes on for months if the first clutch fledges successfully. Two, three sometimes even four nests per season! That’s superb entertainment for up to 6 months if you’re in the southeast anyway. Always remove nests after babies have fledged. Unlike some cavity nesting birds, bluebirds prefer to build a new clean nest for each brood. Promptly removing old nests opens up the birdhouse for their next clutch. 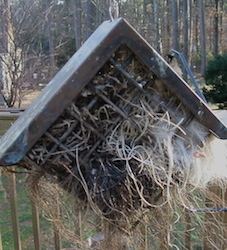 Discard away from the birdhouse (like in the trash) as old nests on the ground or nearby will draw predators. 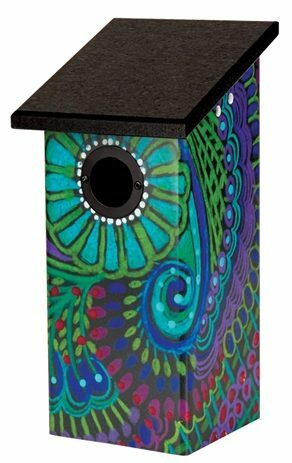 The Paisley Vinyl Bluebird House is whimsical garden decor with total functionality. Upgraded features make this one very bird friendly. Babies will love their fledgling ladder when it’s time to leave the nest! 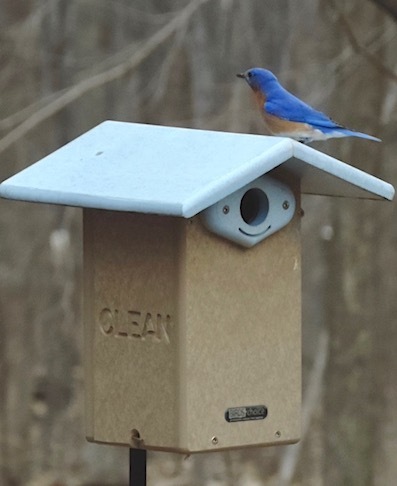 If you happen to be ready for the next level and wish to monitor your bluebirds’ progress (recommended) the popular Gilbertson Nest Box recently received a cool upgrade. An optional recycled plastic roof (poly-lumber) in matching brown looks perfect. The new roof coupled with its vinyl birch-like cavity will be around for many seasons. And tests were performed measuring ambient heat… the plastic roof keeps houses cooler in summer than the the original cedar roof. But for any die-hards out there… the original roof is still available. C’mon spring and happy birding!